During months when it was pleading with the public to raise taxes to help fund its understaffed department, Chula Vista’s police chief and other officials spent months coordinating a private fundraiser, including asking wealthy individuals and private companies – some of whom had business before the city – for money. The Chula Vista Police Foundation is supposed to help raise money for the city’s police department, which is so understaffed and overworked that officers have trouble responding in time to life-and-death emergencies. But when it came time for the nonprofit foundation to host its biggest fundraising event of the year, it needed the department’s help. So, leaders of the understaffed Chula Vista Police Department spent the first half of 2018 planning the foundation’s annual dinner on June 30. That day, the city paid $10,526 in overtime to 20 police officers who worked the gala, known as the Evening with Heroes Reception and Dinner. For months leading up to the dinner, the chief of police and other senior department officials were absorbed, often during work hours, with mundane gala-related tasks, according to over 2,000 pages of emails the department provided to Voice of San Diego. They traded emails about seating arrangements for donors, went back and forth about who should print the brochures, rented sound equipment, arranged rides for people and had to find an auctioneer and host for the event. Perhaps most striking is the dozens of emails police officers, including Police Chief Roxana Kennedy, sent to wealthy individuals and private companies asking for money. They asked would-be donors to sponsor the event or buy tickets to it or donate something for the evening’s charity auction. Some of those would-be donors had business before the city. Police officers, including Kennedy, also talked about using their political connections to get “traction” with companies and get more money for the foundation, though it’s unclear to what extent they may have used those connections as leverage. Other police departments have nonprofit foundations that raise money of their behalf, but those nonprofits often have their own staff to do that work. The Chula Vista Police Foundation raised $239,000 last year. But it does not have its own staff, which leaves police officers moonlighting as fundraisers and event planners. The leaders of the department – the chief; Jonathan Alegre, the department’s administrative services manager; Capt. Vern Sallee, the head of the patrol division; and Capt. Phil Collum, head of the investigations division – all asked people and companies for money. At times, Kennedy not only asked for donations but appeared unhappy when companies didn’t pony up. When Mission Federal Credit Union indicated it would donate $500 to the foundation, Kennedy told Alegre “hopefully” the bank would end up giving more. “Contributions to the Police Foundation or to any of the city’s other collaborative partnerships are never a consideration when evaluating current or future city contracts or services,” city spokeswoman Anne Steinberger said in an email. On Jan. 26, Sallee emailed Kennedy and Eric Crockett, Chula Vista’s economic development director, to pass along an idea. The police captain suggested that Chula Vista Mayor Mary Casillas Salas could get involved in soliciting money from Baldwin & Sons, one of the biggest housing developers in Chula Vista – a company that needs the city’s cooperation to do its work. Sallee also suggested that the Police Department could hit up the company’s subcontractors to get them to donate too. Kennedy replied to say that between her, Crockett, Salas and former Chula Vista Mayor Shirley Horton, the foundation should be able to “get some traction” in increasing Baldwin & Sons’ donation. Horton is a member of the foundation’s board of directors. Crockett urged the officers not to “pester” the company too much but said a lunch “might help them increase” their donation. The lunch ended up being an afternoon meeting instead. On Feb. 21, Kennedy and Crockett met with two Baldwin & Sons representatives for an hour and a half, according to an entry in the chief’s calendar. A few weeks later – after the chief emailed the company to ask for money again on March 12 – the company said it would increase its donation to $2,500, compared with $1,500 the year before. Nick Lee, one of the company representatives in the meeting, said he didn’t think Baldwin & Sons was getting shaken down and that he hadn’t seen the emails until they were provided to the company by VOSD. He said he didn’t sense anything inappropriate, including that Crockett, the economic development director, attended the meeting. “I think it would have weirder if we hadn’t been such a long-term supporter” of the foundation, Lee said. Crockett was involved in at least one other meeting with would-be donors, according to entries in Kennedy’s calendar. In a statement released on Crockett’s behalf by Steinberger, the city said Crockett made introductions but did not ask anyone to contribute to the foundation. An email contradicts that statement. But, he said, had the mayor received the email, she would have helped. “Had she been asked, she would have gladly raised money and talked to folks about the police foundation, because she supports the police foundation,” Estrada said. 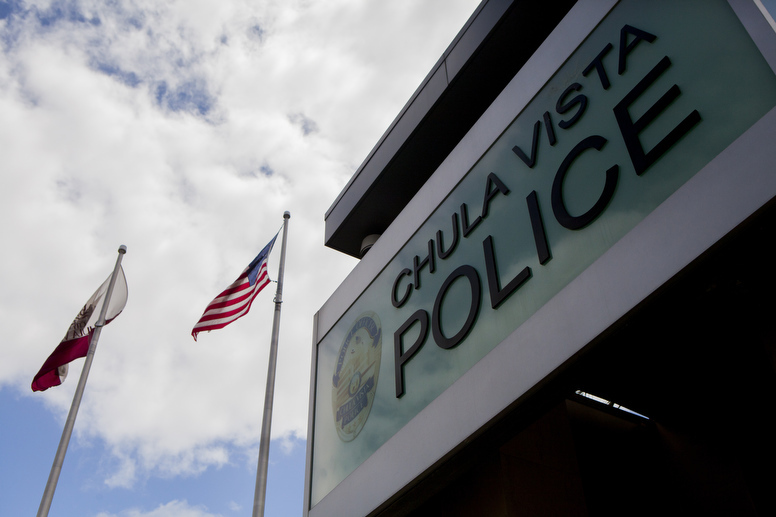 For much of the time this was all going on, Chula Vista leaders were also asking city voters to approve a tax increase to help the department hire more officers. The city admits the department’s response to emergencies is unacceptable. In recent years, it’s taken officers more than six minutes on average to respond to emergency calls. In June, that Chula Vista tax increase passed, providing $17 million more a year for the city to spend on police, fire and public safety services. Kennedy and other department leaders are all salaried – they all make $200,000 or more a year, including pay and benefits – meaning that even though they were doing foundation business during work hours, it’s hard to know if those tasks decreased public safety because they aren’t paid by the hour. But, she said, the foundation is now thinking about hiring its own paid staff.